KidsWizz has been a provider of Software for schools for over 16 years. The website features a smart and simple design – which reflects their powerful yet easy to use software. There is clear and informative information on the Home Page – which features an animated Banner that shows off some key features in a very effective way. A tour page that showcases our clients software and ease of use. 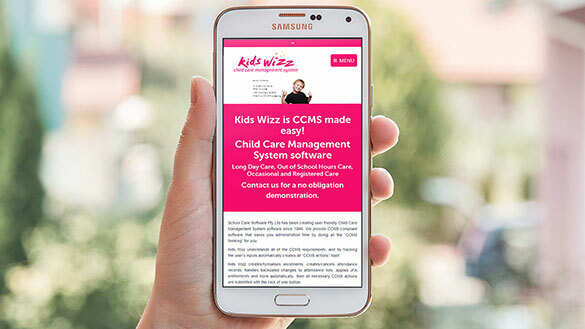 We wanted to ensure that Kids Wizz got a fancy feature that we couldn’t find on their competitors website. The FAQ uses a nifty Accordion menu that allows them to place a lot of information in a small space. Visitors don’t need to scroll through a page – they can select the topic they are interested in and get the relevant information quicker. Kids Wizz get heaps of great Testimonials from their customers, and they wanted to share them all with the world. This page has many testimonials sitting snugly together in an easy to browse page.